I Skate, Therefore I Am: Crooked Skateboarding? Though Cynthia Connolly had been tossing around the idea of a skateboard-themed art show for a few years now, a germ of the idea was planted during a quiet evening in San Francisco, years before the current Artisphere was even a gleam in Arlington’s eye. Connolly cultivated relationships with skateboarding artists for years in preparation for Skateboard Side Effects, the inaugural show at the Artisphere, which opens today at 5 p.m. with an artist talk followed by a reception. 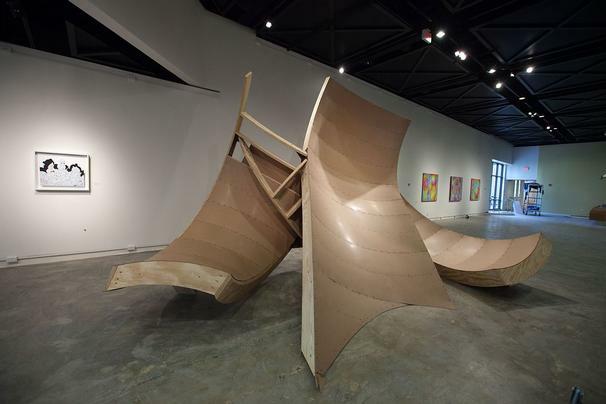 The work ranges from the colorful abstract paintings of Sean Greene, to the massive sculpture she commissioned by Richard Vosseller that serves both as a sculpture and a skateable ramp. Connolly hosted a group of skaters to skate the ramp last week — they’re featured in a video in the gallery — but it’s too dangerous to have anyone come in and try it. Like Skateboard Side Effects, other skateboarding shows that have featured sculptural ramps and bowls, like the Free Basin piece that Deitch Art Projects hosted in 2003. That bowl was also part of the Beautiful Losers traveling art exhibit in 2004, which chronicled the DIY/punk/skateboarding movement, and in which Connolly also participated.